I knew it was that time of year again when I saw the church sign. I know you’ll all be surprised, but I haven’t photographed it yet. It’s along the interstate right after the on ramp, and I am too cautious to stop, and too busy to make an extra trip out of my way to the front side of the building. Although the trip would most definitely be worth it. The sign reads: God loves a Volunteer. 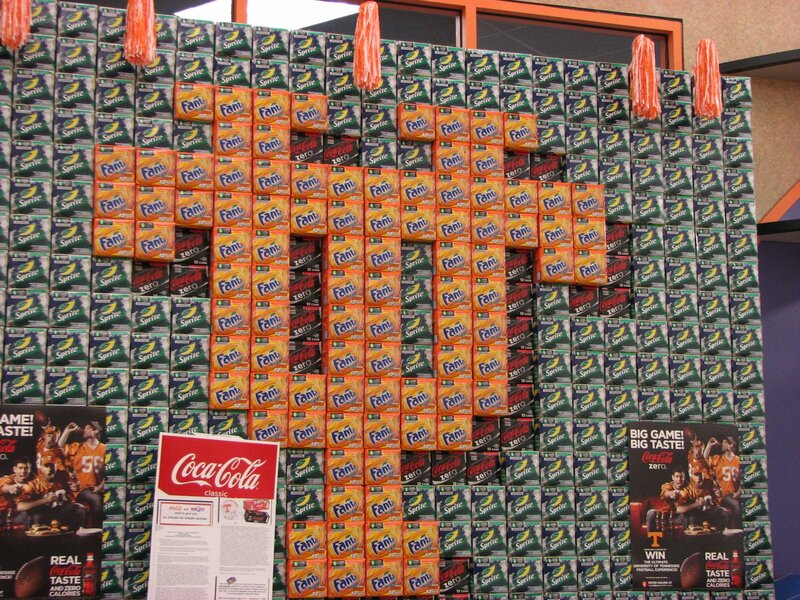 Knoxvillians are crazy about their UT Vols. Especially during football season. I’m sure you’ll all be impressed that I captured this license plate while driving on the interstate. I think this plate belongs to Abigail’s first grade teacher. I didn’t get close enough with my camera to make sure it was her. It seems to freak people out when you follow them and then point your camera in their face. Personally, I love football season. I know that I can finally go to Wal-Mart on Saturday and not have to fight the crowd. EVERYONE is home watching the game. 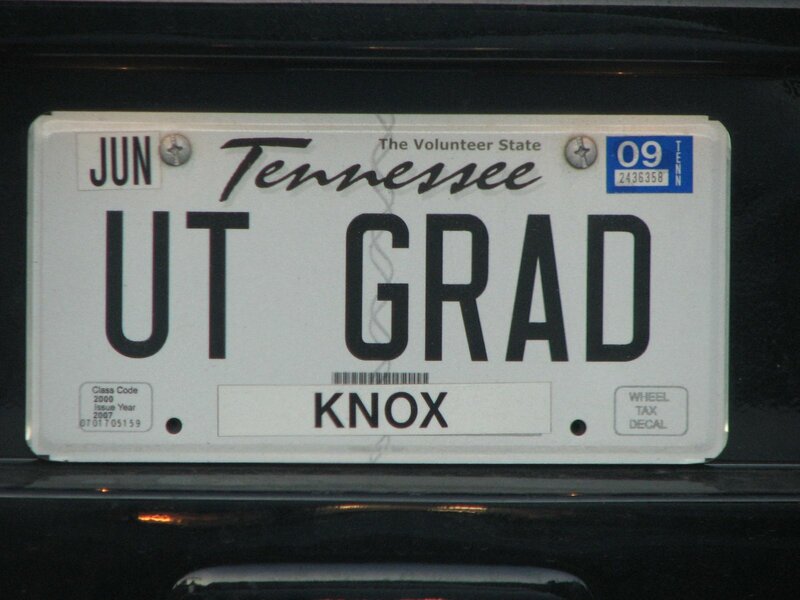 And for that, and for my husband’s law degree…I say…..GO VOLS!!! Here is the soda pop display at the local Food City grocery store. Holy crap, you are famous for taking shots in your car. point and shoot, I don’t mind. I love football season! I hope you were the passenger while taking that photo…if not you have some mad photography skills! lol! Go VOLS! If you live here you bleed orange right? girl, you have some serious skillz with that camera and a moving vehicle! The grocery store also has some skillz going on! I’m so glad I didn’t do it! it would take me too long! So – when my husband goes to the BYU games, he wears a red plaid shirt. I have asked him whether he wants me to purchase a new BYU t-shirt, and he says no. “I want to stand out in the crowd!! !” I worry for his safety! Yeah, I don’t have any orange either!Saturday I had to drop Rachel off in a subdivision in town and there was a house that looked like the orange fairy had coughed up about 100 of those bow thingys that everyone in TN uses to decorate. ANd then an elderly woman walked out the door.Head to toe orange.Later I found out Saturday was a game against a big rival. I don’t remember who. I thought that UT stood for urinary tract (infection), or maybe University of Utah.I really have nothing against the University of Tennessee. Although, my neighbor said that if he ever sees orange with blue, he burns it (big U of Kentucky fan, go blue, I guess). Paul was invited to their big game (UT vs. UK) the other day. He had to decline.I remain a Coug fan. Go Blue! Their ranked #10 or 11 now!